L-com's NEMA enclosures, electrical enclosure and weatherproof (outdoor) enclosures are ideal for remote WLAN WiFi equipment installations, indoor and outdoor, hot and cold temperature environments, solar powered applications, corrosive environments, sub-zero installations, hotspot applications and protection of equipment from theft or damage. The enclosures feature both ABS and fiberglass NEMA rated designs and are available with a wide range of options including: heat, cooling, AC or DC power, and Power over Ethernet (PoE) interfaces. 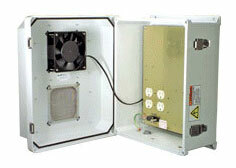 120, 240 and EURO 240 VAC enclosures are also available. If you are interested in an enclosure for your SonicWALL Product, please contact us today!